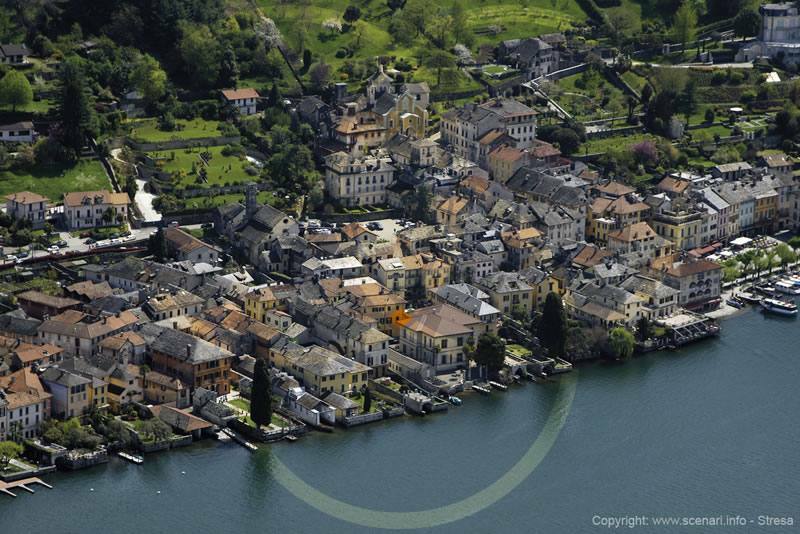 The ancient village of Orta San Giulio rises on the end of a headland stretching out from east towards the waters of Lake Orta. This strategic position is an ideal stage from which to admire this small body of water. 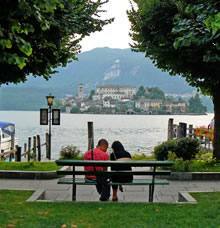 Isola di San Giulio (San Giulio Island) is just a short distance away, on the tip of the headland a few hundred metres from Piazza Motta in the heart of the village. This piazza - now dedicated to Mario Motta (a partisan from the Cusio area) - is Orta’s meeting place and the heart of life in the town. The market has been taking place here Wednesdays since 1228. Concerts and other activities and cultural events are also organised here. Excluding the side overlooking the lake, the 3 remaining sides are enclosed by old buildings, porticoes and horse chestnut trees. Palazzo della Comunità or Broletto is on the southern side, but detached from the buildings. It dates back to 1582 and as with many other municipal buildings from the late Renaissance period, the ground floor is entirely porticoed. Access to the first floor is by an external flight of steps leading to a single hall where the Council of the Community of the Riviera gathered, an ancient dream of independence for the Cusio area granted by the bishops in Novara. Looking towards the lake is Isola di San Giulio with the Palazzo dei Vescovi and the Basilica of San Giulio bell tower rising between the water and sky, and on the other shore are the houses in Pella. A series of characteristic, narrow, winding alleys branches off from the piazza, which are closed to traffic and have many exclusive buildings in different styles, as well as shops and pubs. Visitors can search for wrought-iron objects and have lunch in the pubs where the local rice-and-wine-based cuisine can be tasted. Taking Salita alla Motta (the road up to the Sacro Monte of Orta) first leads to the Parish Church of S. Maria Assunta, whose 17th-century porch and Oira serpentine marble portal dating back to 1485 are worth mentioning, as is the work inside of San Carlo Borromeo and the procession in Milan, by Giulio Cesare Procaccini. Continuing the climb, it takes less than 15 minutes to reach the Sacro Monte of Orta. 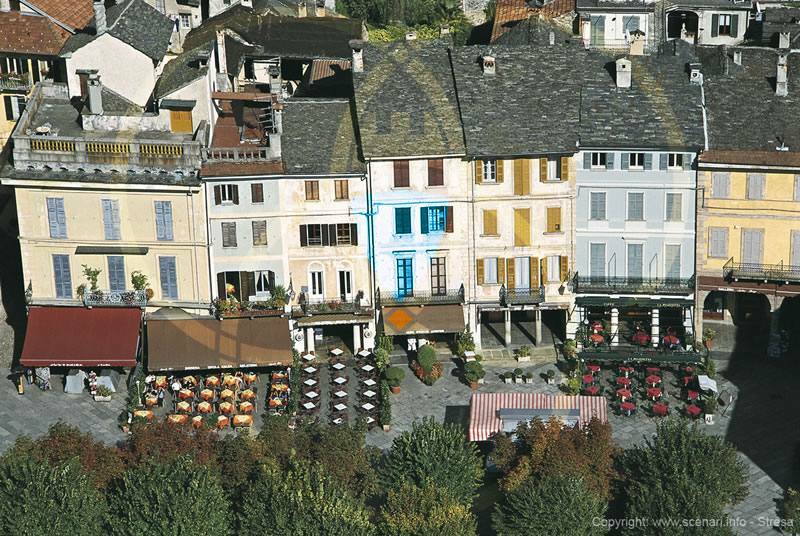 According to Nietzsche, this is one of the most “charming places in the world”. It was designed in 1591 and dedicated to St. Francis of Assisi. The Special Nature Reserve it is located in is home to beech, linden and pine forests. At the summit (approx. 400 metres asl), after a route with 20 chapels containing 376 terracotta statues illustrating the life of the saint, is the Church of S. Nicolao. The complex contains frescoes by Morazzone, Della Rovere, Nuvolone, Legnanino and Cantalupi. The village also has other districts such as Villa to the north in the direction of Pettenasco, whose buildings are decorated with wrought iron, or Moccarolo, which follows the lakeshore to the south where exclusive villas with gardens directly overlooking the lake are next to the most humble, old buildings of fisherman and craftsmen (often having medieval foundations). Among these is Villa Motta, which offers an exceptional scenic point (see the following sheet).